This is the first in a very long series of posts which are mopping up some un-published finished objects from the last couple of years. 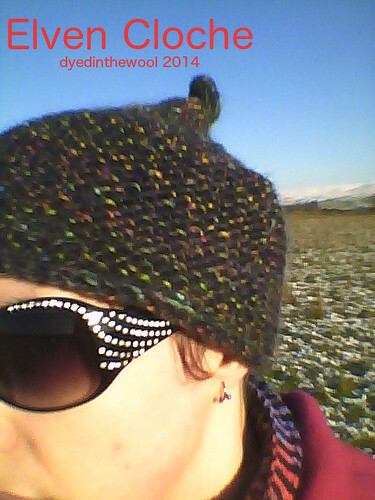 Nb: Sorry about the quality of the photos – they were taken with the front camera of my phone while I was out for a walk! Some times a pattern and a yarn just fall into place with each other! This black/variegated yarn doesn’t show off the pattern to it’s fullest degree but it was a fun, quick knit and I only had to go shopping in my stash. Win-win! Pattern: Elven Cloche by Rosemary (Romi) Hill from The Great Oddments Knitdown eBook. One size. 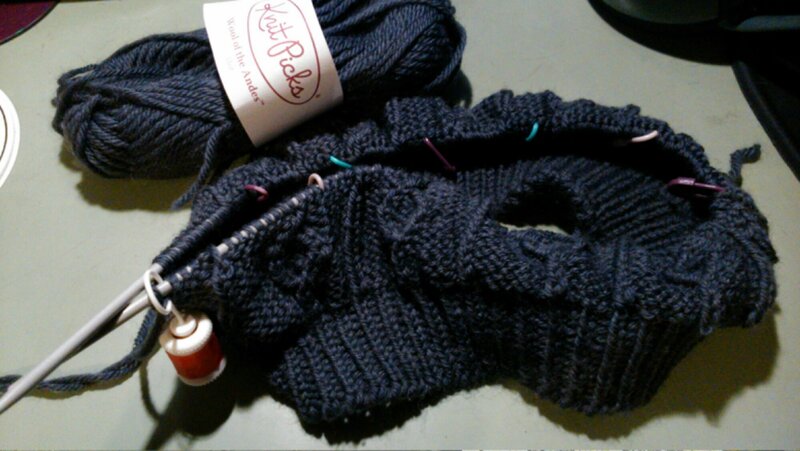 Yarn and needles: Sirdar Cossack Chunky (67% Acrylic, 30% Wool, 3% Rayon) – discontinued yarn. 88.2 yards, 60 grams 0.6 skeins = 88.2 yards (80.7m) used. 4.5 mm dpns and one 6 mm long circular needle for magic loop. Dates: 5th – 8th Feb 2014. This is the “leaf” portion of the hat (no, really. Well, I suppose you’ll just have to trust me then!). No modifications at all, in the actual knitting. Opted not to sew up one side so I have both ears covered at the same time. 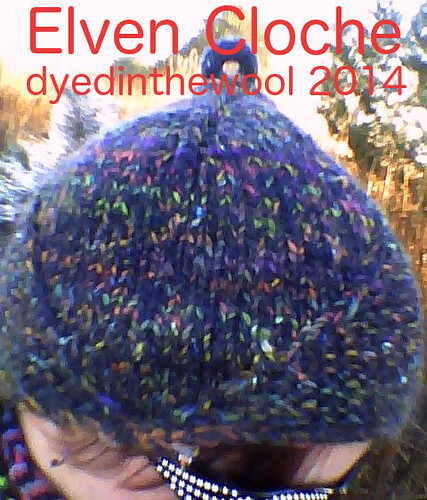 This hat was made from the remnants of my crocheted Pixie Slippers, and I still have 20 g or so left. Yarn and needles: Patons UK Diploma Gold 4ply in Black and Cream. Mittens and hat used up 1 ball of each colour (2 balls, approx 400 yds, in total). Magic loop technique with 2.5 mm 100 cm long circular needle. More details of the mittens. Note the alternate cable cast on in the upper right. Really pleased with how these turned out. The mittens are super-warm and very practical. I’m glad I made the effort to do the flip top thumbs as it makes handling things like coins, without exposing myself to frost bite, very easy! App shown is County for Android. Disclosure: I know the developer, Polly, but I was not paid for this product placement. This version of the app is the free one anyway! I’m making a hat. With yarn. On some needles. It’s the WoollyWormhead Mystery KAL for 2013.